Every morning at Matins, when we pray the Apostle's Creed, we pray the phrase, “He descended to the dead” as in “He suffered under Pontius Pilate, was crucified, died, and was buried. He descended to the dead.” And for such a bold but unexplained statement I find the way our Eastern Christian brothers and sisters understand theology a much more comfortable way to approach such a mystery. For the Orthodox, theology is, well, an art form. It is as much about icons, poetry, hymnody, liturgy and prayer, as it is about intellect and study. It's not that they don't engage in lots of study, they certainly do. But that's not the only thing they do to seek Christ, as we might say in our Benedictine tradition. And make no mistake, theology for the Orthodox is not so much an academic pursuit, but rather the very seeking of Christ. 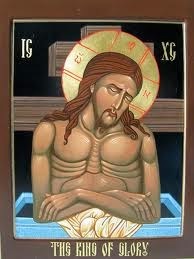 Now many people have told me over the years that Holy Saturday is, for them, a day of emptiness. A few will say, a day of waiting or anticipation, but most of those who have spoken to me about it say that they experience Holy Saturday as a day that is empty. Akin, perhaps, to the day after a funeral of a loved one. And while I am not going to tell you how or what to feel today, I would like to suggest that there is another approach to Holy Saturday, an approach that is artful, prayerful, even mystical. But one that I think is available to all of us. Now pre-Christian hell was conceived not as we sometimes think about it as a place where unrepentant sinners go. Rather, it was a place for the dead. For anyone who has died. In their thinking, the Fathers of the Church were divided on what the spiritual consequences of being dead before the time of Christ were, but it is clear for them that all humanity descended to this nether world of captivity. Now let's just take that it in for a moment. Christ, having just been murdered in a gruesome way, continues to experience what all humanity experiences by descending to the dead. He descended to hell to preach to the dead. Christ's plan for salvation is not only for those who were living during his earthly life or for those who would come in the future. No, Christ's plan for salvation is for all of humanity for all time. That includes, according to Cyril, not only the Righteous Jews, but also all pagans. Those two groups, for him, represented all of humanity at the time of Christ. If we extrapolate out the modern understanding of what the totality of humanity consists of, that means that Christ was preaching to people who had been dead, in some cases, for millions of years. And the theological point that I think is important here is that Christ's plan for salvation is for all the living, all the dead, all those yet to be born. And Christ will stop at nothing to preach, reach, touch, save, love all of us. All of humanity. Every member of every religion, every race, every culture, every language group. Every captive. What humanity experiences on Holy Saturday is something outside ofchronos, chronological human time, and is better understood as being experienced in kairos, that is, a season for God to act in a time that humanity may not fully grasp. That experience of Holy Saturday is nothing less than the emptying of hell because Christ desires for humanity to turn from worshiping death toward worshiping Him, the very fountain of life. However, though Christ has led captivity captive and brought salvation even to the nether world, the lure of death and hell are powerful. Even though Christ has emptied hell, he still searches among the dead, the lost, because so often we human beings seem to have some kind of proclivity to choose death rather than life, to make our own hells on earth. Just think about the last hundred years and the way in which humanity has created its own hell by continuing to turn from worshiping God in order to worship death: Death in the form of mustard gas, concentration camps, killing fields, lynch mobs, napalm, drones, nuclear weapons. From the assassination of the Archduke Ferdinand in 1914, to the latest drone attack that occurred in Yemen this morning, humanity has chosen, time and again, in an unprecedented way over these last hundred years, to worship death and to create our own hells on earth, even though Christ left the devil “abandoned and lonely”. It has been a century of darkness and death. This proclivity for darkness and death is almost beyond the explainable, yet even now, Christ will never give up on us. Just as he searched the darkest corners of hell to save every member of the human family, Christ still searches for us even as we modern humans have embraced an unprecedented worship of death. And that embrace is sadly shared by all of us. For most of us in this church, that embrace is shared primarily through ambivalence or complacency. But that complacency allows the purveyors of death to rule our lives whether we want to admit that or not. And so my invitation to all of you this Holy Saturday is to listen for Christ's preaching in those areas of your life in which you might have died. Has your zeal for peace died within you? Has the virtue of love for the least brother or sister died within you? Has your greatest patience with prayer or service to the poor died within you? Listen my sisters and brothers with the ear of your heart and know that Christ preaches to that which may have died within you this day. Christ never gives up on you! Not on any of you! And knowing that – believing that – will then give us the strength we need to accompany Christ into all the darkest places that we human beings have created on earth. Those places where we as a people have died: in the slums we have established in order to neglect the poor; in the camps we've filled with refugees we'd rather fence in than liberate; in the limousines of gun manufacturers who are laughing all the way to the bank as our children are slaughtered in their classrooms; in the factories of death that our government calls nuclear weapons laboratories. Let us go to those places and preach like Christ to the dead. Let us announce this Holy Saturday, that a new and different century is about to begin - a Century of Light and Life. A century in which we preach, reach, touch, save, love all of humanity. Let us proclaim that Christ suffered under Pontius Pilate, was crucified, died, and was buried. That he descended to the dead. That on the third day he rose again and that he ascended to heaven. From where, this Holy Saturday, he sends us forth to preach to the dead. Holy Saturday empty? I'd ask you to consider a different approach in your prayer today. AMEN.